With just a few days to go for Diwali, Prime Minister Narendra Modi on Friday launched a "historic" Support and Outreach Initiative for the micro, small and medium enterprise (MSME) sector. As part of this programme, the Prime Minister unveiled12 key initiatives which will help the growth, expansion and facilitation of MSMEs across the country. Modi said that the 12 decisions that he is announcing today, will mark a new chapter for the MSME sector. Noting that MSMEs are one of the principal employment generators in India, the Prime Minister recalled the glorious Indian traditions of small scale industry, including Ludhianaâs hosiery, and Varanasiâs sarees. He added that the success of economic reforms launched by the Union Government, can be gauged from the rise in India's âEase of Doing Business Rankings,â from 142 to 77 in four years. The Prime Minister said that there are five key aspects for facilitating the MSME sector. These include access to credit, access to market, technology upgradation, ease of doing business, and a sense of security for employees. He said that as a Diwali gift for the sector, the 12 announcements he is making, will address each of these five categories. As the first announcement, the Prime Minister announced the launch of the 59 minute loan portal to enable easy access to credit for MSMEs. He said that loans uptoRs. 1 crore can be granted in-principle approval through this portal, in just 59 minutes. Modi mentioned the second announcement as a 2 percent interest subvention for all GST registered MSMEs, on fresh or incremental loans. For exporters who receive loans in the pre-shipment and post-shipment period, the Prime Minister announced an increase in interest rebate from 3 percent to 5 percent. The third announcement made by the Prime Minister was that all companies with a turnover more than Rs. 500 crore, must now compulsorily be brought on the Trade Receivables e-Discounting System (TReDS). He made his fourth announcement, thatpublic sector companies have now been asked to compulsorily procure 25 percent, instead of 20 percent of their total purchases, from MSMEs. The Prime Minister said his fifth announcement is related to women entrepreneurs. He said that out of the 25 percent procurement mandated from MSMEs, 3 percent must now be reserved for women entrepreneurs. His seventh announcement was that 20 hubs will be formed across the country, and 100 spokes in the form of tool rooms will be established. On Ease of Doing Business, the Prime Minister said his eighth announcement is related to pharma companies. He said clusters will be formed of pharma MSMEs. He said 70 percent cost of establishing these clusters will be borne by the Union Government. The Prime Minister said that the ninth announcementis on simplification of government procedures. He said the ninth announcement is that the return under 8 labour laws and 10 Union regulations must now be filed only once a year. The Prime Minister said that the tenth announcement is that now the establishments to be visited by an Inspector will be decided through a computerised random allotment. Modi said that the eleventh announcement is that under air pollution and water pollution laws, now both these have been merged as a single consent. He further said that the return will be accepted through self-certification. As the twelfth announcement, the Prime Minister mentioned that an Ordinance has been brought, under which, for minor violations under the Companies Act, the entrepreneur will no longer have to approach the Courts, but can correct them through simple procedures. Sir, I sincerely admire our PM's speech, Our PM intends to shorten the time taken for loan approvals, I truly admire and bow to our PM with due respect for having recognised,liquidity issue for MSME,delayed payments from big companies,tax and inspection authorities harassment is really a torturous one, I would say ,until unless RBI doesn't scale down regulatory norms , the fear around government bank officers will continue and slow down the disbursal process,as a matter of fact,one of the bank officer mentioned to me saying " today we are scared to take any aggressive step to help businesses as our careers are at stake", naturally they are scared because RBI is fuming at their neck for strict reporting rules, I understand that strict guidelines are required for large loans, why should one have the same rules applied for poor MSMEs, who in general are very honest, after all the entire MSME loans are not even equivalent to one large NPA of toady's top 10 in the country. 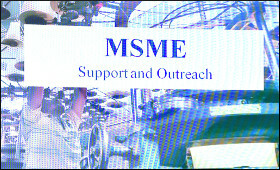 RBI applying same yard stock to MSMEs is not fare, today's scenario is that they have let loose biggies and piling on MSMEs, that's unfair,I request our PM to look into the following few points 1.Reduce and regulate,excessive harassment for delayed instalments 2.Regulate torturous misbehaviours by hired collection agents 3.Create friendly atmosphere between bankers and MSMEs 4.Remove asset classification and alert mechanism norms given by RBI for bank officers to work without fear.